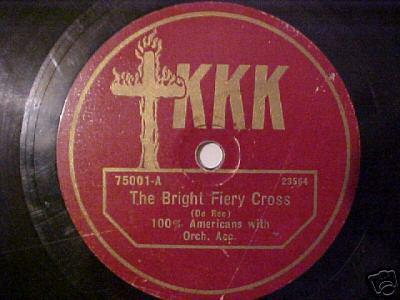 I once went to a rural flea market in SW Washington and found a really creepy record with a rebel flag on it and it turned out to be one of the most offensively racist records I've ever come across. I felt kind of stupid for buying it. I later saw that it goes for a fairly large sum (for a 7" 45) in the used record market. Discogs has since banned the sale of anything on that label in the wake of the rebel flag controversy - not that I intend to sell it. I hate the thought of someone actually wanting it, thinking it's cool. I only bought it (for 50 cents) because I like strange, outre or even 'creepy' records but this one just smolders in my collection and I'm tempted to break it into tiny pieces and throw it in the garbage. Was it a Reb Rebel label 45 with Johnny Rebel on it? We acquired an estate collection at my old record shop that had a few of these. Plus some neo-Nazi skinhead punk amongst the rock albums (including ironically, a Jimi Hendrix record.) There was no way in hell I was ever going to put those out on the floor so they remained in the office never to be seen or heard from again. By chance, one of our customers was a African-American history professor who collects racist material and when he mentioned that hobby, I took him back to the office and showed him the records. He offered $100 but I gave them to him gratis. I just didn't want to see them again. I can't even begin to mention the titles of some of these songs, they're just so filthy. That's a very classy way to handle that situation. Glad you gave 'em away. I have one of those Johnny Rebel records as well. I bought it at a flea market or something knowing it was going to be reprehensible, but I wanted to hear it just out of curiosity.